The T3 Apple iPhone 4S review is finally here! In the 16 months from the launch of the iPhone 4, we've had antennagate - the iPhone 4 had serious reception issues due to a misjudgment in the placing of its antenna - the unveiling of iOS 5, Apple's latest mobile operating system, and three versions of Google Android's Honeycomb OS. smartphones with faster processors and more features, all trying to steal a march over Apple and its seemingly unstoppable freight train of success. Many T3 readers have told us how they'd forgone the Apple iPhone 4 because of reported signal problems, or were tied into long 3GS contracts. They were itching for something new. Something special. Something worth waiting for. So, when Phil Schiller, senior vice president of worldwide product marketing at Apple, took to the stage to announce the long-awaited 'iPhone 5' last week, he needed to pull something big out of the iBag. What we got was the iPhone 4S. The most powerful iPhone Apple has ever made, yet criticised by many as nothing but a cosmetic upgrade. signifying that a new antenna design lurks within. Switch on the phone, however, and things are different. Unless you're restoring the data from an older iTunes backup, the 4S doesn't require a computer for activation. You can restore the phone from an iCloud account, or set up as a new phone. If you don't have an Apple ID, you have the option to create one. iCloud can also be activated from the phone for storing and wirelessly pushing photos, apps, contacts, calendars to and from your 4S. The whole process, whether restoring from iTunes or setting up fresh, takes less than five minutes. And because it's the same case design, iPhone 4 users can just swap over their SIM card. Unfortunately, in-app information isn't transferred, so you'll need to re-enter login details, re-download offline Spotify playlists and re-affirm personalised settings in every app that requires it. An obvious security measure by Apple, but it was these actions that took the longest to complete. Many iPhone 4 owners will be asking themselves why they need an iPhone 4S when the free iOS 5 upgrade will equip their current phone with most of the new 200-odd features. We'll get into the meat of those features later, but know this: Apple has built its best phone to date. The new A5 dual-core processor (as seen in the iPad 2) makes things noticeably nippier. Apps launch quicker, web pages load faster, multi-tasking is more fluid and resource-hungry apps like Pages now allow you to edit documents without any lag. Competitors will argue that their phones have been able to produce similar results for months, and they'd be right, but it remains a welcome (if a little late) upgrade. The processor also supercharges the iPhone 4S's graphical prowess. We tried Real Racing 2 HD and, while the visuals were a little smoother, we didn't notice the 7x improvement as claimed by Apple. This is because games will need to be tuned to take advantage of the new chip. We had a demo of Infinity Blade 2 (confirmed to launch later this year) at the iPhone 4S launch and were blown away by the detail and speed of the polygon pushing. We're talking PSP Vita graphics, if not better. Another benefit of having the A5 processor is to mirror 4S content over AirPlay. Wirelessly, the 4S will push out 720p to an Apple TV. Over connected HDMI, that will jump to 1080p. The simplicity of pushing small-screen content to the big screen on the fly is a neat trick, especially when you start rotating and zooming. 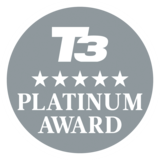 It's also something to brag to iPhone 4 owners; T3 was told that the older model simply can't cope with the demands of such technological wizardry. The potential for playing games on the big screen from your phone is something Sony and Nintendo should keep an eye on, too. Note that, in our demo, the super-charged Infinity Blade 2 was jumpy over wireless. Tiny Wings has never looked better, though. Antennagate rocked Apple's world for the wrong reasons after the launch of the iPhone 4, so we were keen to see how the new design 'improves call quality' and 'reduces risk of dropout'. Both the 4S's antennas, which run around the top of the phone, can transmit and receive data, allowing for faster 3G connections. Apple claims that maximum download speed over HSDPA is 14.4Mbps – twice as fast as the iPhone 4. In the few days we've been testing, we haven't noticed an improvement in call quality and didn't experience any dropouts. But we have definitely seen faster download speeds over 3G and quicker web page loading. T3.com took an average of 5 seconds to load on the iPhone 4S, compared to an average of 8 on the iPhone 4. We also ran the SpeedTest app (on O2-UK network) and got an average of 3.34Mbps download and 1.45Mbps upload. On the older iPhone 4, on the same network in the same location, we achieved average results of 2.32Mbps download and 1.31Mbps upload. We also tried the death grip (for old times' sake) and didn't see any signal bars dropping off a cliff. Hurrah. The camera's had a major overhaul, now capable of taking eight-megapixel stills and recording 1080p video. Apple claims upgrades to the optics allow for more light, better colours and improved white-balancing. We didn't dismantle the 4S to find out, but did take a range of shots in a variety of conditions to test the assertion. Photos are crisper, no question, but it can't compete with traditional cameras with bigger lenses in low light. You can now choose to have a grid on the screen when taking shots, perform basic image-editing within the Camera Roll and jump straight to the camera function via a shortcut. Log into Twitter and you can post photos from the Camera Roll directly to your feed. It's quick and makes a cute tweet sound when sent into cyberspace. Anti-cutes can, however, switch off this slice of audible joy before tucking into their sour-faced sandwiches. iOS 5 brings with it the option to use the '+' button as shutter when taking landscape shots. Face detection is also an upgrade and works well. The 1080p, 30fps camera is impressive. Clarity and detail are excellent and the A5 processor allows for image stabilisation of the go. Shaky hand, be gone. We played back footage on our 47-inch TV and, even in full screen, video quality was great. We can hear the home camcorder industry wincing from here. Sound quality is limited due to the small in-built microphones, but good enough for most things, especially YouTube where videos can be uploaded directly from the 4S. Which leads us onto a point of compromise; with an upgrade in image quality comes an increase in file size and it's no wonder Apple needed to launch a 64Gb version. You'll also want to do more uploading and sending over wi-fi as not to upset your network operator and/or bank balance. The command “call my wife” resulted in Siri asking who our wife was from our address book. Once confirmed, repeating the same instruction resulted in a call to the wife. 1-0 Siri. “What is 477 multiplied by the circumference of the moon?” we asked. Siri consulted the Wolfram Alpha engine and presented an accurate and detailed result. It's 6786.03 miles, in case you were wondering. 2-0 Siri. You can also have fun with Siri – asking it things like the meaning of life, the meaning of naughty swear words, why Siri exists, or whether Brian Blessed has the loudest voice in human history. The results can be entertaining. We'll leave you to discover them. Siri needs at least a 3G connection to operate and we found that Wi-Fi works better. It's presently in beta, so we're expecting some improvement as and when updates are released. 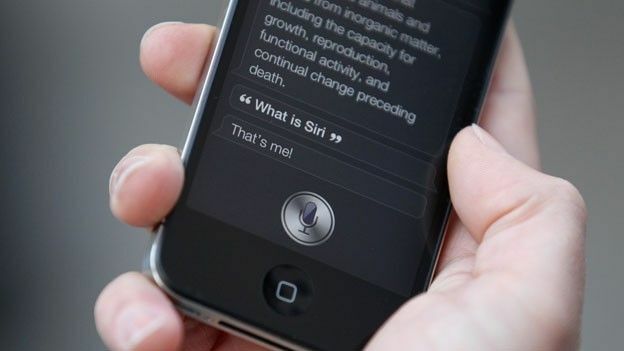 Albeit fascinating and entertaining, we don't think Siri is reason alone to upgrade to a 4S. It's undeniably amazing technology but we just can't see how often people will use it. Asking it to do things like “set the alarm for 6.30am tomorrow morning” will save a few buttons clicks, but most things we asked of it are quicker to do manually. Apart from the moon calculation bit. If you do decide to form a relationship with Siri, a word of warning: your partner will go mental. Smartphones already come between us and our dearest, so striking up a conversation with a robot rather than talking to your beloved, or Siri being the last person you talk to before falling asleep might just be a step too far in today's society. The notion of cloud computing is still a mystery to many and we were pretty skeptical as to how Apple, the maestros of uncomplicated explanation, would decipher this one for the mainstream. But therein lies the genius, you don't have to understand how iCloud works to get it working or benefit from it. You just need to enter your Apple ID and start using your Apple kit. Mail, contacts, calendars, reminders, bookmarks, notes, are all updated whenever you make a change. It takes the pain out of worrying where things are and gives you time back. We're amazed Apple is giving everyone 5GB of storage free, but think an upgrade (and accompanying annual subscription) will be all but necessary for those with a half decent media collection. iTunes in the Cloud isn't currently available in the UK so we haven't been able to test music, movie and app syncing. PhotoStream is a cool feature of iCloud but we found the time between taking a picture on the 4S and it appearing in our iPhoto stream slow. We'll update as to whether this was a case of teething. Although part of iOS 5, rather than iPhone 4S-specific, notifications are a a great addition to the art of using an iPhone. Run your finger down the top of the screen to bring up a list of your latest feeds from Twitter, Mail, Facebook, calendar and reminders, among others. You can customise what appears in the list and how notifications appear – in the centre of the screen or a banner at the top of the phone. Again, many phones already have this, but it'll be a welcome first for iPhone fans. Battery life has also been improved. Apple claims 8 hours of 3G talk time, upto 9 hours of wifi use, 10 hours video playback and 40 hours of musical pleasure. In our experience, we can say that when compared to the iPhone 4, all of these activities had less of a drain on battery. Whether this will still be the case in six months time, we'll have to see. We did notice the battery draining a little quicker when in standby, however. So, as previously mentioned, the iPhone 4S is the most powerful and feature-packed phone that Apple has ever made. The camera, processor and antenna are all well-needed improvements. And Siri is eccentric genius, if a little before its time. However, the fact that you can upgrade your old iPhone 4 with a smorgasbord of brand new features for free, with iOS 5 and iCloud, will undoubtedly put many off upgrading to the new phone. 16 months is a long time for the competition to catch up and the iPhone 4S has some serious opposition. However, what no-one else can offer is the colossal, yet slick infrastructure that is iTunes and iCloud. And this may be just enough to coerce those teetering on the edge into opting for the iPhone 4S. What's more, are people really going to wait another year to see the iPhone 5? It may not be what people were hoping for - whatever that looked like - but the iPhone 4S is now the best phone from the Apple stable. A powerful mobile device with a great OS and some cutting-edge tech to boot.